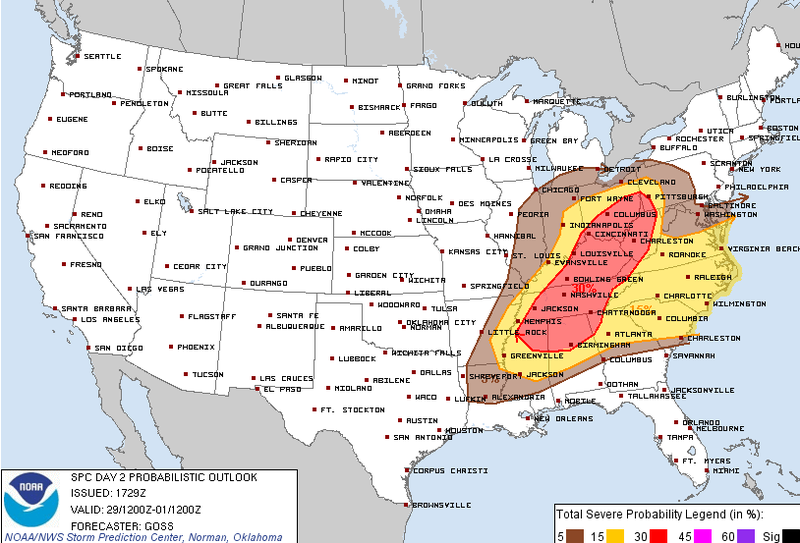 After a day like today, with a borderline moderate risk setup and Tornado Watch that ends up busting pretty bad, it would be understandable to head into the next event with a little skepticism. However, this is what meteorologists do - mess one up, then get back up and charge full-steam into the next! So here we go! Since most of our efforts the past few days have been concentrated on today's events, we haven't talked too much about Friday. That would be the weatherman's version of the old sports cliche about "overlooking the next opponent." With today behind us now, it's time to look ahead. Despite talking publicly mostly about today, we have also kept a close eye on Friday and models are in pretty decent agreement with the latter portion of the event - the cold frontal passage and the weather associated with it. What they absolutely do NOT agree on is the early morning hours and we'll start there. In the wake of today's cold front, humidity has plummeted as Gulf moisture was shoved south. 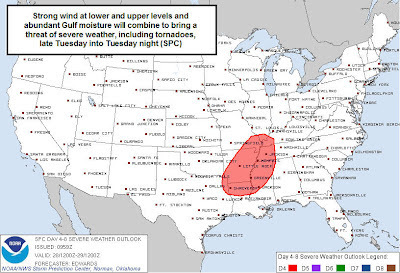 However, this will be short-lived as a warm front ahead of Friday's system surges back north Thursday night, bringing that warm moist air back to the Mid-South. 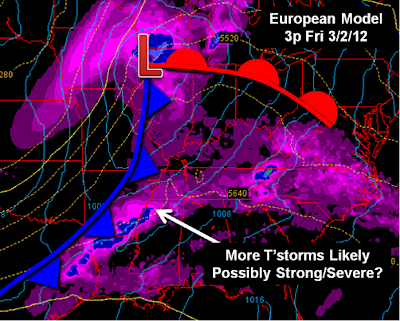 A couple of normally reliable models (GFS, ECMWF) indicate that rain and thunderstorms will break out in the pre-dawn hours Friday morning around this warm front, with some possibly containing hail and a threat of strong wind. The other model we use a great deal (NAM) is the one that performed the best leading up to today's system and it says "no dice" on Friday morning. 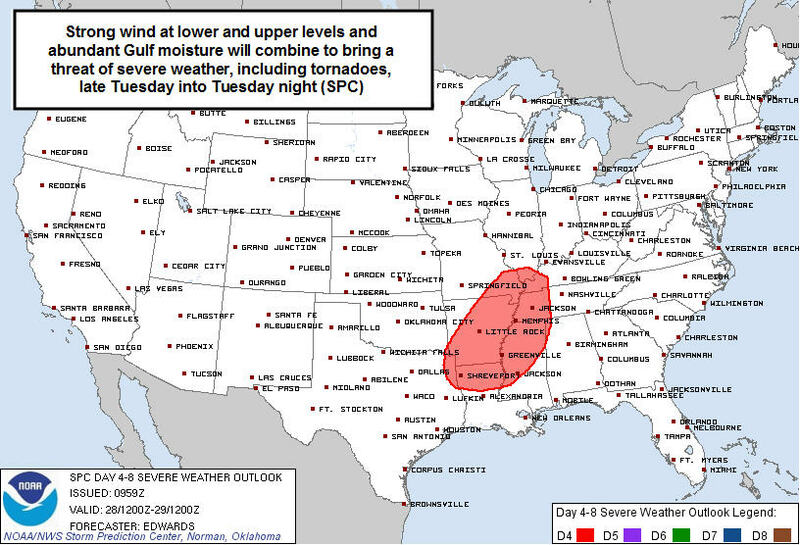 The Storm Prediction Center and NWS-Memphis go with the former theory and we'll try it again as well! 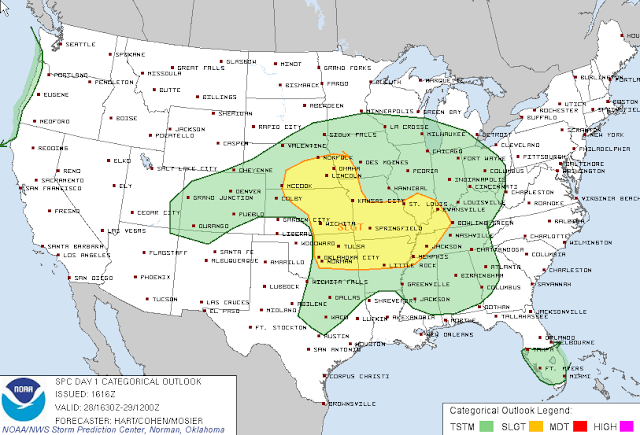 SPC places the metro in a Slight Risk for large hail and strong wind with some storms early Friday. We'll then see a break in the precip in the wake of the retreating warm front and prior to the arrival of the cold front, which should move into the metro in the early evening hours. 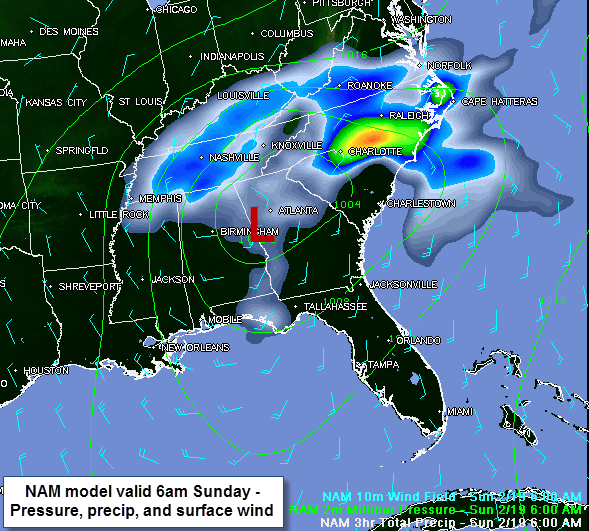 The break will be a chance for the atmosphere to A) energize on abundant Gulf moisture flowing north on gusty wind and B) likely destabilize with some sunshine and temps warming into the mid to upper 70s. 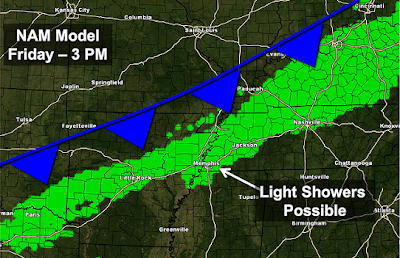 All models indicate widespread convection firing ahead of the cold front late Friday afternoon into Friday night. 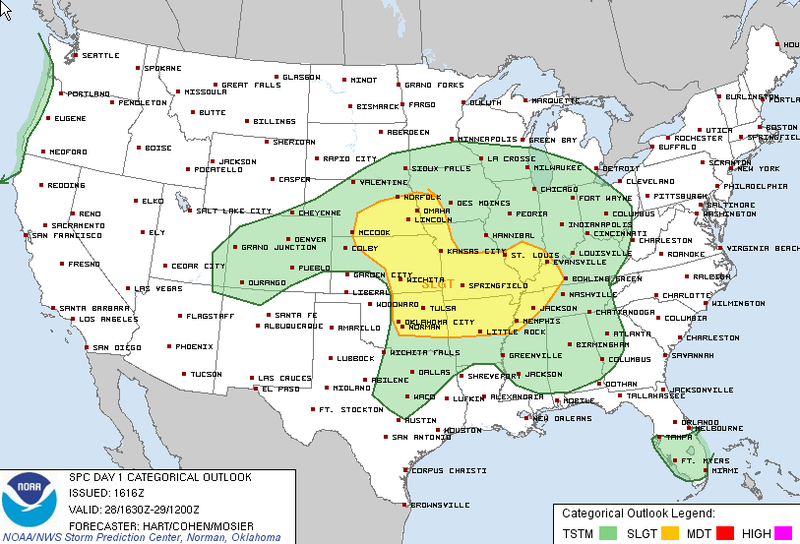 The big question is - like today - does this happen to our west (putting us in line for severe storms) or to our east (missing the metro entirely)? It'll be close. For now, we plan for the worst and hope for the best. A Slight Risk is also in place for Friday afternoon and evening with the primary threat being damaging wind and isolated tornadoes. I would say the highest risk is east of the metro, particularly NE MS, north AL, and middle TN ,where the tornado threat may be a little higher as well. The MWN Storm Center has maps showing the details. The good news is that once this system moves through Friday night, we'll be left with DRY conditions (and mild) for several days, including a nice looking weekend! Expect an update again tomorrow. 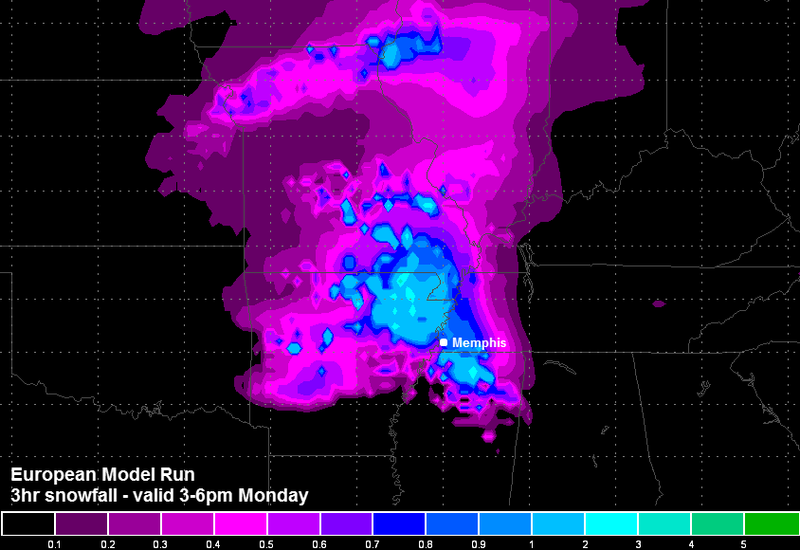 The full MWN Forecast can be found here. 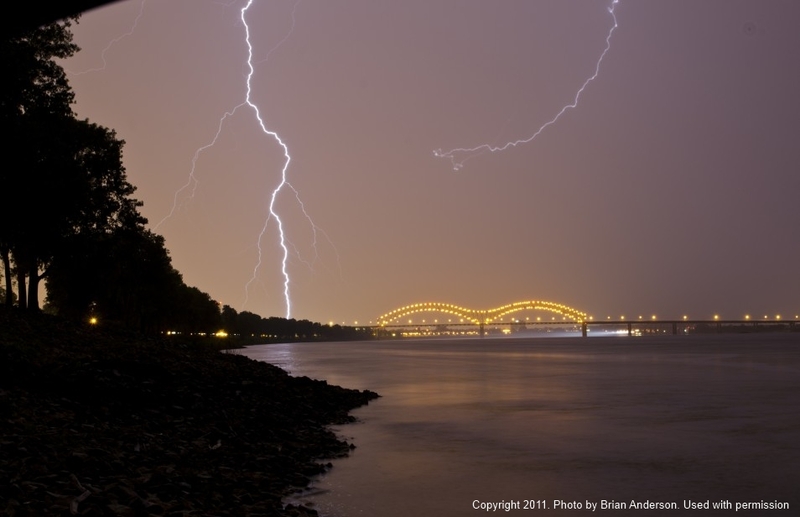 MEMPHIS WILL ISSUE SAFETY MESSAGES ON THE FOLLOWING TOPICS. 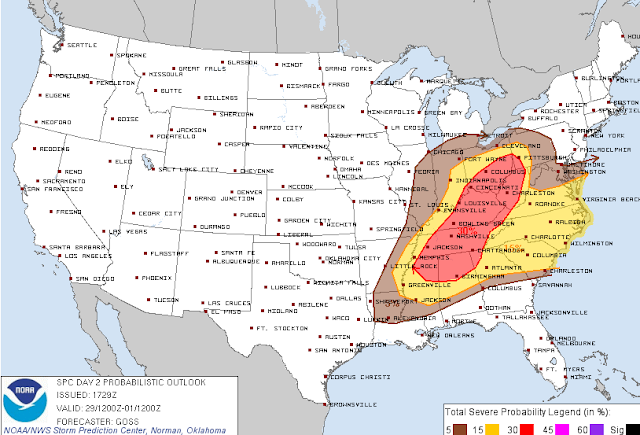 MONDAY...WE WILL FOCUS ON SEVERE THUNDERSTORMS. 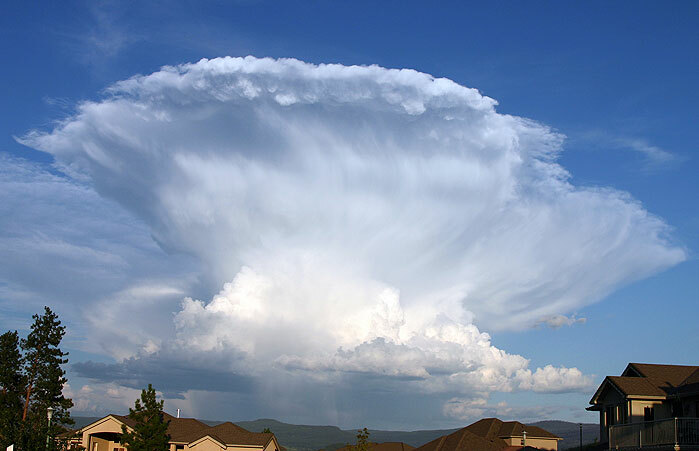 TUESDAY...THE TOPIC WILL BE LIGHTNING. 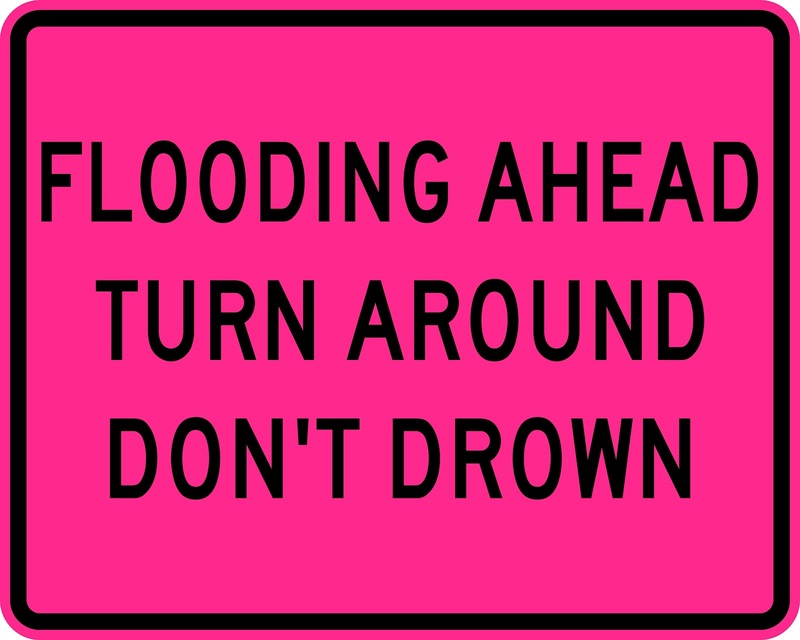 THURSDAY...WE WILL LOOK AT FLOODING AND FLASH FLOODS. 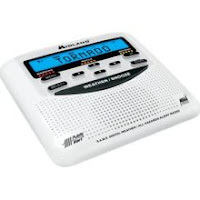 FRIDAY IS WEATHER RADIO DAY AND THE EMERGENCY ALERT SYSTEM DAY. 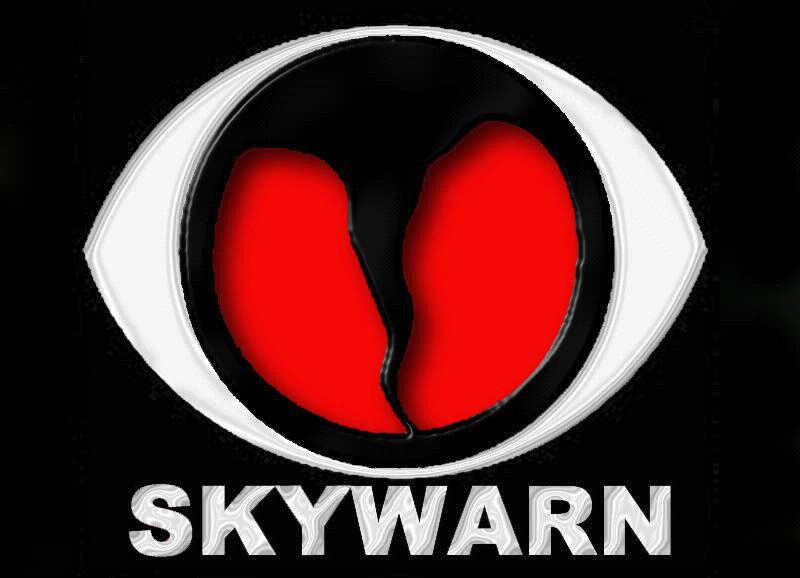 DISCUSSION ABOUT THE SKYWARN STORM SPOTTER PROGRAM. 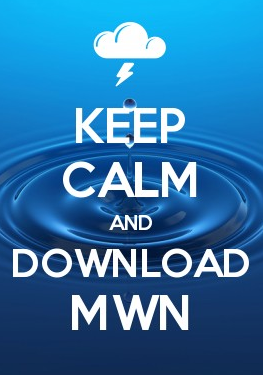 In addition to re-distributing information on topics above from the NWS, MWN will also include additional information on each topic that will be helpful to our fans, followers, and visitors, including highlighting parts of the MemphisWeather.net website or other services we offer that fit the topic for that day. 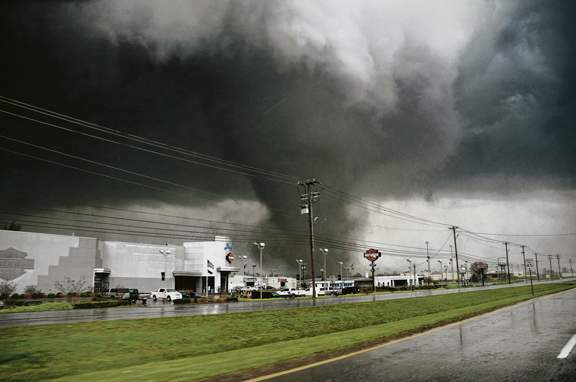 Be sure to follow along on the blog throughout the week as we highlight various aspects of severe weather as we strive to inform and educate Mid-Southerners! 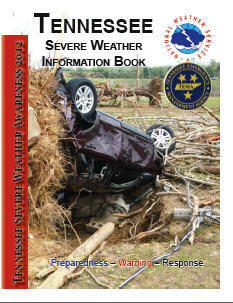 For more information on Severe Weather Awareness Week in Tennessee, visit this NWS website or download the 11-page severe weather awareness book (PDF) for TN (front cover above). For those who have followed along with our blog posts the past couple of days, thank you! If you have read them, you know the models had been fairly consistent up to this point with tomorrow's potential winter weather scenario, with a couple of exceptions in the details. Today, I bring you good news (for some) and bad news (for probably many others). 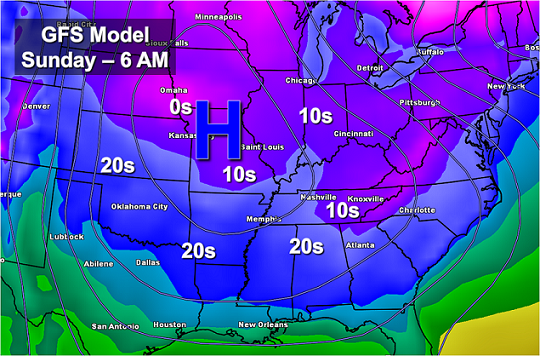 This morning's models are taking a turn towards a warmer scenario, especially in the 3-7,000 foot level or so. What does that mean? IF they are trending in the right direction, it means the metro could see less snow than previously thought, and more rain - if not perhaps some ice as well. 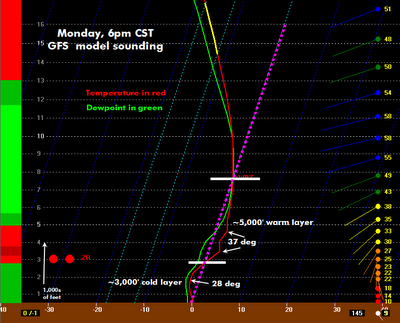 I'll use the atmospheric sounding profile below to explain. If you want "just the facts," skip down below the graphic for today's bottom line. As mentioned in previous blog posts, the atmosphere has some recovering to do with very dry air in place behind Friday night's Arctic front. 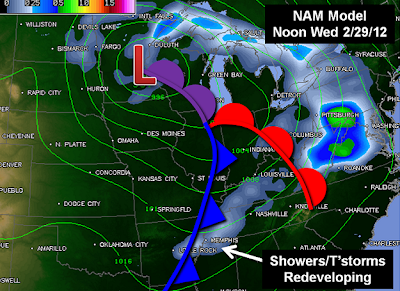 That will delay the onset of precip until after lunch, and maybe mid-afternoon, on Monday. 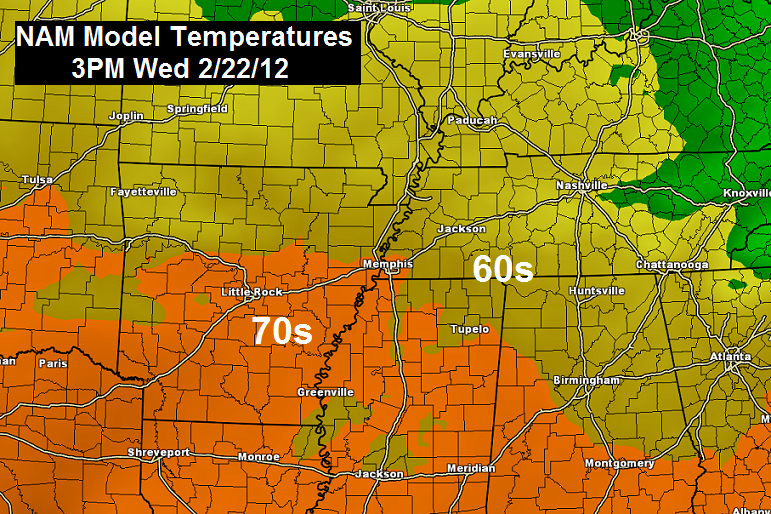 The changes in the models have to do with the temps in the lower (non-surface) levels of the atmosphere. 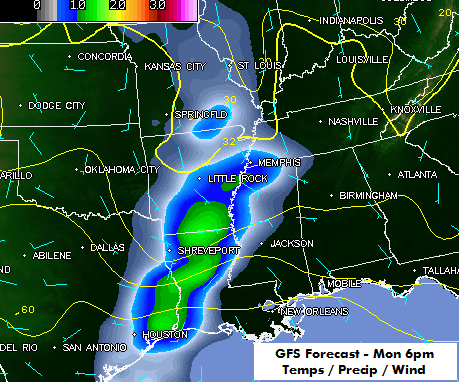 The graphic below shows the GFS model's interpretation of the temperature and moisture profiles at 6pm Monday. This is after precipitation has been falling for a couple of hours. Quick orientation of the graphic: this is a slice of the atmosphere at Memphis with the top of the picture at 17,000' and the bottom at the surface. 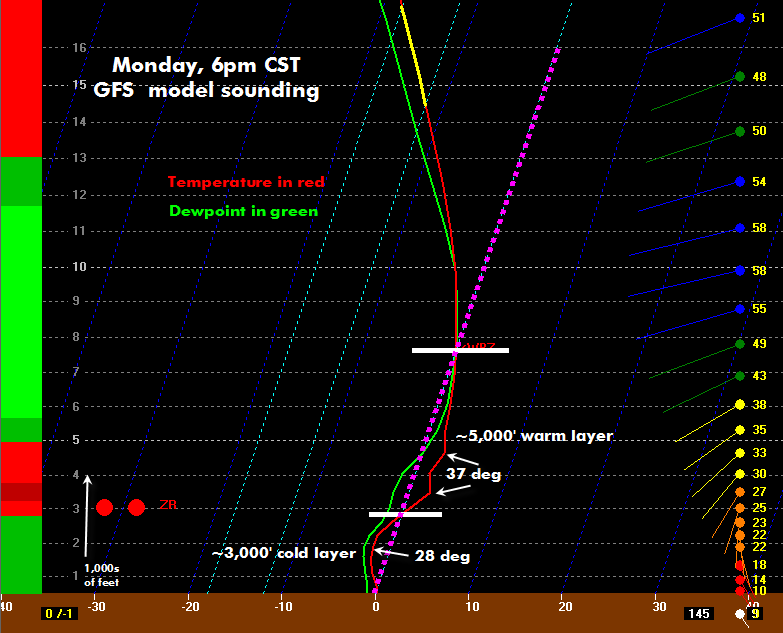 The red plot is temperature, green plot is dewpoint, and dotted pink line is freezing. 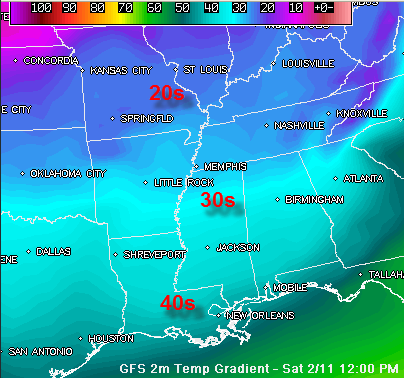 Where red/green are right next to each other, the humidity is very high (near 100%). 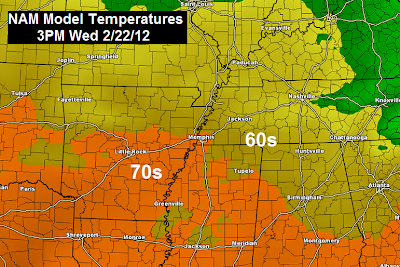 Timing & temperatures: Both have changed very little. Precipitation is expected to start after lunchtime Monday, perhaps as late as 3pm, and continue through the evening, with most ending (except for light rain/drizzle) around 9pm or so. At onset, temperatures will likely get to near 40, then fall as precipitation starts, reaching the lower 30s (perhaps freezing) by rush hour. 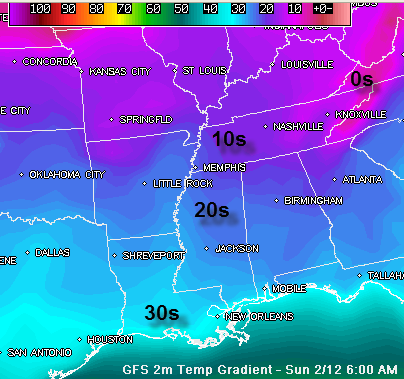 They will then recover slightly to the mid 30s overnight Monday night. Precip type: At onset (early afternoon), I expect a mix of snow, sleet, and possibly rain. That should fairly quickly (by late afternoon) change to a rain/sleet mix with some flakes possible as well. By early evening (6-7pm), it'll probably be mostly rain. 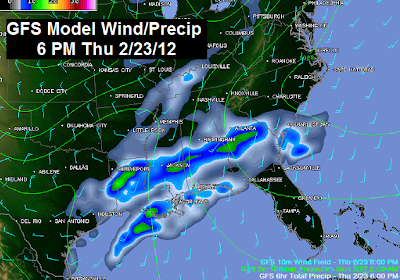 The heaviest precipitation should be between 3-7pm, when the predominant precip type will likely be rain/sleet. I also cannot rule out some freezing rain during this period if the surface temperature gets down to 32 (some bridges and overpasses could get to 32 even if the air temp is 33-34. Watch for slick streets during the afternoon commute home! Overnight, temperatures should stay above freezing in most locations, though outlying areas could see 32 degrees. Roads should be in decent shape overnight into Tuesday morning, though drizzle/light rain will be possible until dawn Tuesday. Accumulation: In the immediate metro, the most likely scenario brings up to a half-inch of snow/sleet by rush hour, perhaps a light coating of freezing rain, topped off by light rain and rising temps that will likely melt anything that falls during the night. 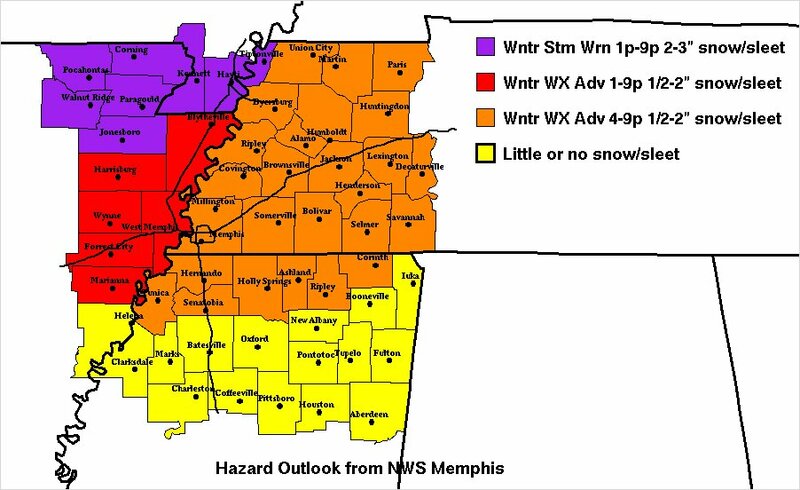 To the north (Tipton Co and points north), higher amounts of snow/sleet are more likely with a slightly higher chance of freezing rain in the evening. Over north Mississippi, it's possible that sleet/rain will be the predominant precip type, with little accumulation, washed off in the evening by rain. Much of the finer details may not become known until the event begins. Be prepared for anything mentioned above, anywhere from mostly rain to some minor ice accumulations, to snow/ice mix with rain on top of that. 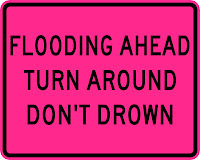 We'll continue to monitor the situation very closely and bring you updates via the MWN Forecast and on our social media feeds, including Facebook and Twitter . In addition, our mobile apps for Android and iPhone include StormView Radar with precipitation type (which shows you rain/snow/ice), the forecast, current conditions, and our Twitter feed (without having to sign up for Twitter). Finally, within the apps, you can upgrade to StormWatch+ which will push you notifications of any Winter Storm Watches, Warnings, or Advisories as soon as they are issued by the NWS.